We are pleased to announce that Millers Oils, USA will be sponsoring the #07 BC Race Cars Inc. TA2 Camaro in the 2016 Trans-Am series as well as becoming the exclusive supplier of racing oils for our entire TA2 team. 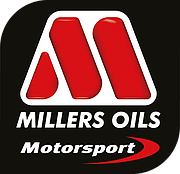 Millers Oils is a well known company originating out of the UK, famous for their innovative products and petroleum blends. They supply industrial, commercial and automotive markets across the world. For motorsports, they have developed Nanodrive technology which greatly reduces internal engine friction while maintaining superior lubricant film integrity. “ We are very pleased to be working with BC Race Cars in their effort to bring home the Trans Am Title in 2016. Blaise is well known and well respected within the TA series and we are confident that working together will contribute to the continued success of both companies”, says Karl Poeltl, President of Performance Racing Oils, USA, the exclusive North American distributor. Also to thank is Bill Comat, of Comat Motorsports, the Canadian supplier for making the introductions and working tirelessly to put the deal together.